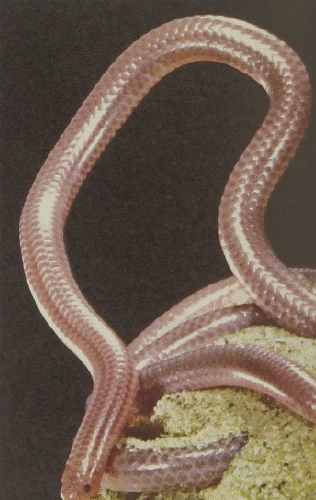 The Slender Blind Snake belongs to one of three families of small, cylindrical, glossy snakes that spend most of their life underground, generally in association with colonies of ants and termites. They retain vestiges of the pelvic girdle but all traces of external I imbs have disappeared. The head has been structured for burrowing by having the anterior edge rounded and the mouth shifted to the lower surface. The jaws are very small and the teeth are found only on the lower pair. 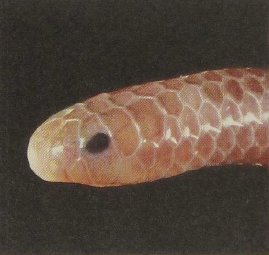 In the true blind snakes the scales have very large free edges so that any one overlaps the bases of the next three in a row. Their shiny surface provides good protection against the bites of some insects: the sharp jaws of the attacker just glance off the smooth armor. These snakes also produce secretions in their cloacal glands which deter the attacks of the ants with which they associate and on which they feed.